By now, nearly everyone has heard of the “obesity epidemic.” And sadly, obese kids become obese adults: About 80% of kids who are overweight at 10-to-15 years of age will be obese at age 25. And many of these obese children already show increased risk for “adult” diseases, including heart disease, high blood pressure, and type 2 diabetes. Fortunately, there is an answer to this problem. Providing healthy food in school meals and educating kids, parents, and staff about the importance of good nutrition and exercise improves the health of kids in grades kindergarten through sixth grade. A research project called Healthy Options for Public School Children targeted four elementary schools in Osceola County, Florida. These schools received nutrition, physical activity, and lifestyle education; school meals modified to include nutrient-dense, healthy foods; and parent and school staff education on the importance of a healthy lifestyle. After two years, the kids in the four elementary schools, particularly the girls, showed measurable improvements in health as compared with children in a control school, which did not receive the Healthy Options program. Blood pressure decreased significantly among girls during the first year of the Healthy Options program and the trend continued in year two of the program. Girls in the control school experienced a slight rise in blood pressure over the two years. Scores for body weight and body mass index (BMI)—a measure of weight adjusted for height—decreased significantly among girls throughout the Healthy Options program. There were no changes in weight or BMI scores among girls in the control school. The average weight and BMI scores among boys in the Healthy Options schools decreased slightly, though not significantly over the two-year study period. The weight and BMI scores for boys in the control school decreased slightly over the two-year period. Weight and BMI scores were developed and measured to account for the fact that actual body weight may not decrease because children are growing, but the children can become thinner relative to their peers over that time. Being involved in your kids’ health, both at home and through the school system, is an important part of ensuring a long, healthy life for them. Studies have shown that parents’ own behavior has a big impact on kids’ habits, so model healthy behaviors at home. Serve healthy meals; have healthier snacks, such as apples, yogurt, whole grain cereals, and cut-up fresh veggies on hand for hungry little ones; and make physical activity part of your family’s outings. If your child’s school does not offer physical activity and nutrition education programs, contact the school. Try the principal or the school board to find out if changes can be made to reintroduce these important activities. 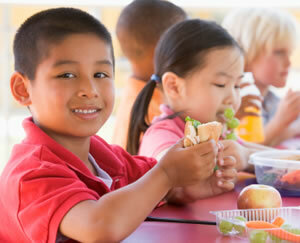 Ask your child to bring home a sample of the school lunch menu. You might be surprised at the array of unhealthy offerings on hand. Contact the school’s food service administrator to request healthier options. They will only get healthier if you ask for change. In the meantime, send your kids to school with lunches packed at home. Stay aware of screen time and balance it with daily activity. Get your kids out for a game of tag, a bike ride, or a trip to the YMCA for some swimming.